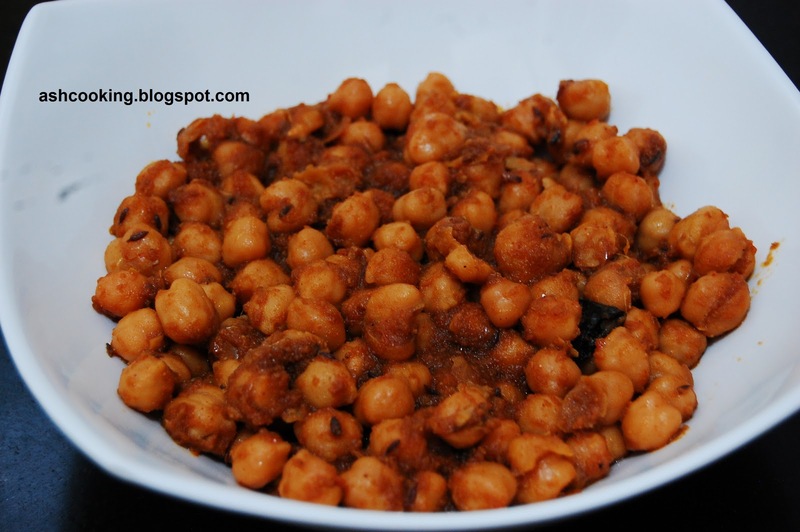 Sweet Tangy Chana Masala is an awesome concoction that complements chapati, roti and even rice well. Post-marriage in Kolkata, this is what I carried in tiffin to my workplace often, mostly because it was easy and took less time for preparation. 1) Boil the chickpeas in pressure cooker till 8 whistles. Drain and keep aside. 2) In a processor grind onion, tomatoes and green chillies to a smooth paste. 3) Heat oil in a wok. When oil turns piping hot, add the ingredients for saute and wait for them to crackle. 4) Add onion, tomato and green chillies paste and fry them till they turn translucent. Add ginger-garlic paste. Stir around for 1 minute. Mix in the spices including dry mango powder, turmeric powder, cumin powder, coriander powder, chilli powder and tamarind pulp. Saute for 5-8 minutes. Add 1/2 cup of water when the mixture gets dry. 5) Pour the boiled chickpeas into the mixture. Fold in, add salt and sugar. Cook covered for 5 minutes. 6) Serve hot with chapati or rice. Spicy and Interesting Recipe Shared by You. Thank You For Sharing.